Welcome to Outside Comfort zone Morning Talks ?
? Ricardo Koanuka just came from working in Antony Robbins crew in London. He will share two of Tony Robbin’s technics on how to be aware of our state of mind, to get desired results in life. Ricardo Koanuka is an entrepreneur, international public speaker and coach with Master in NLP. Jens’ beliefs about the business world were fundamentally challenged when he made his first work experiences. He learned how impersonal, inefficient and profit-oriented the way we work is. Wondering if that should be the status quo, he started looking for alternative ways of doing business. As a result, he founded HumanBusiness with the idea to put the human into the center of all business activities. Jens now helps individuals and organizations to realize their full potential by making the way we work human. Wake up with a Winner mindset! 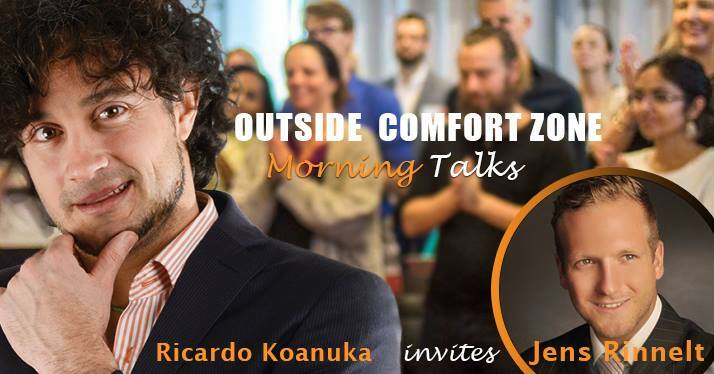 Outside Comfort Zone (OCZ) was founded by Ricardo Koanuka with the mission: Create a community where we encourage each other to achieve our goals and improve our social skills with interactive and motivational speakers. Morning Talks gives space for the audience to interact and listen to new and professional speakers.